Today I have for you a healthy salad that is perfect for making ahead. I made a big batch of this salad on a Sunday and had it throughout the week for lunches. You can eat it warmed, cold, and even add a scoop of it in a wrap or tortilla. I just love simple, versatile salads loaded with lots of flavor and can be more than just a salad. 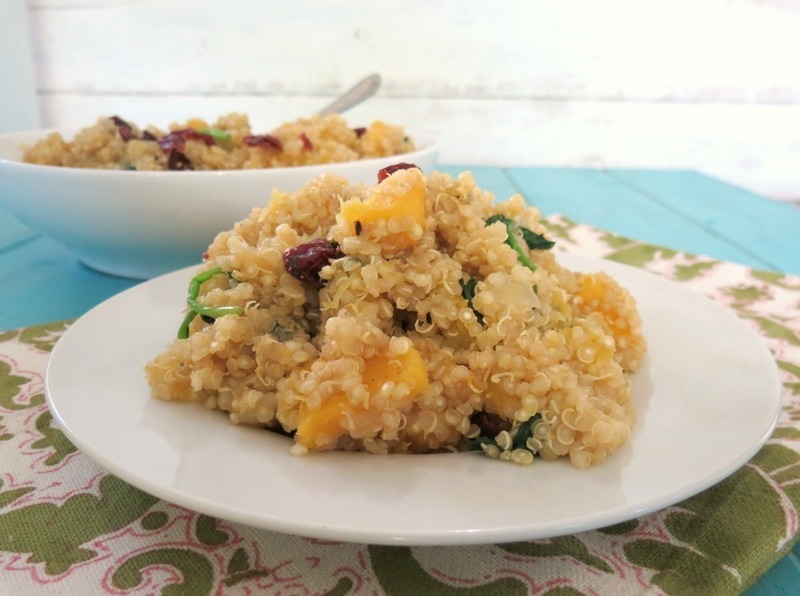 This is my Delicata Squash and Cranberry Quinoa Salad. It’s loaded with a big punch of flavor and nutrition! 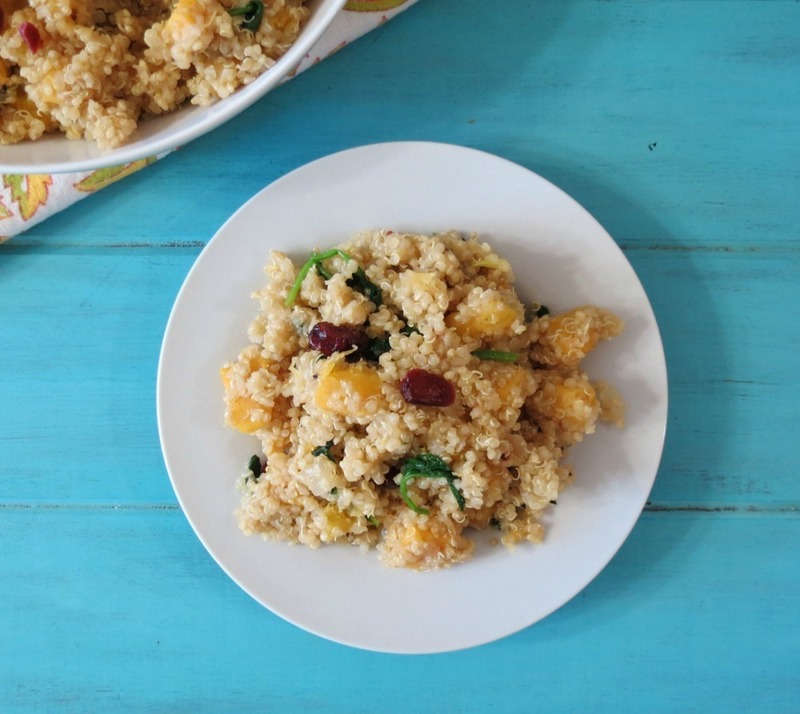 It’s made with quinoa that was cooked in vegetable broth for extra flavor. It has roasted delicata squash that has been baked in the oven and seasoned with cinnamon and cayenne pepper. All tossed together with sauteed onions and spinach. For a little extra sweetness and chew I threw in some dried cranberries. I think I can throw cranberries in almost any kind of saald. he he Oh baby this is an awesome salad!! Since my Husband won’t touch quinoa or squash with a 10′ pole, I took individual servings and placed it in a freezer bag. Then you open the freezer bag and pop it in the microwave for 3 minutes and you have a perfect side dish to accompany almost any kind of meal!! I love having nice side dishes like this! My Husband has frozen veggies and I have this! I think mine is way better! This recipe makes 5 one cup servings that comes in at 188 calories and has 5 grams of fiber and 6 grams of protein! It’s healthy, nutritious and filling. You can’t beat that! Plus like I said, it really goes great on top of a salad or in a wrap. 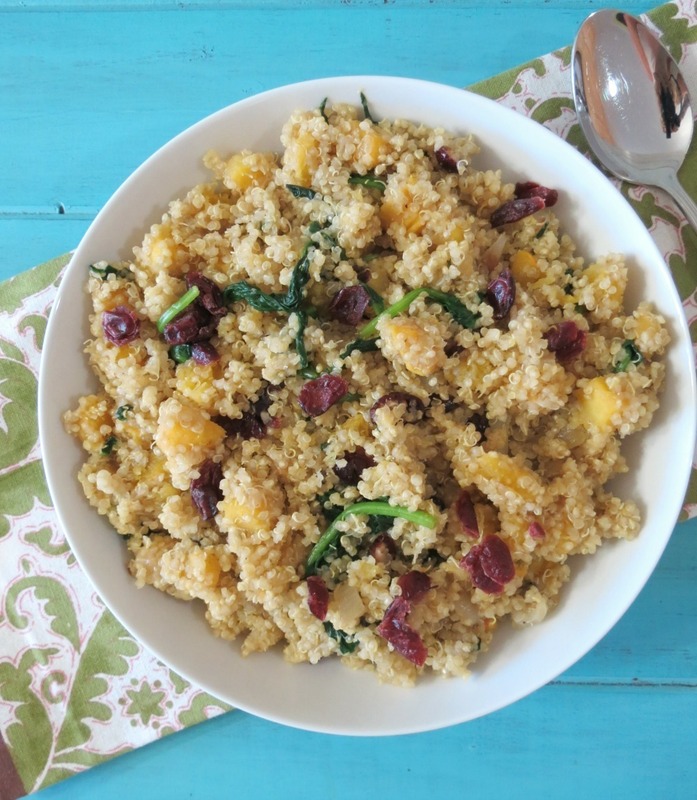 A healthy, light vegan sweet and savory side dish made with roasted squash, quinoa and tossed together with sauteed onions, spinach and cranberries. Peel, seed and chop squash into bite size pieces. Place squash onto cookie sheet and spray with cooking spray, season with cayenne pepper, cinnamon, salt and pepper and give it a mix. Roast for about 20 minutes or until squash is fork tender, flipping half way through. Meanwhile, in a pot add vegetable broth and quinoa. Bring to a boil, place on simmer and cover and simmer for approximately 10 minutes, until broth is evaporated. Fluff with a fork. In a skillet add olive oil and onion. Cook over low-medium heat for about 3 - 5 minutes, until onion is tender. Add squash,to the skillet and a couple of handfuls of fresh spinach and cook until spinach is wilted. Add quinoa to the skillet, mix until incorporated. Stir in cranberries and place in serving bowl. I really enjoy quinoa and I have a ton of it on my shelves, yet I don’t make it nearly enough. I guess it’s because my Husband doesn’t like it. I don’t understand why? Crazy man! It’s so good, healthy and filling!! I also think this dish would make for a great Thanksgiving side dish. It’s a nice change-up from the traditional beans, mashed potatoes and corn. Of course you can have those side dishes too because, well I think you need that on Thanksgiving. Plus leftovers, yes please! LOVE leftovers!! So tell me, what is your favorite Thanksgiving side dish? For me it’s the stuffing or cranberry sauce. Homemade cranberry sauce that is. Yum!! Well I am off to Trader Joe’s! I need some serious groceries! Plus all of this food talk is making me hungry! Jennifer this sounds tasty! I’m definitely going to try it. My husband didn’t like quinoa until I started cooking it a little differently and now he loves it. First I rinse it. Then I soak it for 15 minutes in the liquid I cook it in. Then bring to a boil, cover and cook until liquid is absorbed. It’s not as crunchy this way. I need to get my Husband on the quinoa train like your Husband. He thinks it’s funny looking so he won’t even try it. He has no idea what he is missing out on! What a great looking salad, love the idea of putting it in a tortilla, just like you your other one that I loved so much!!! Thank you Tara! You are too sweet!! This looks so scrumptious! 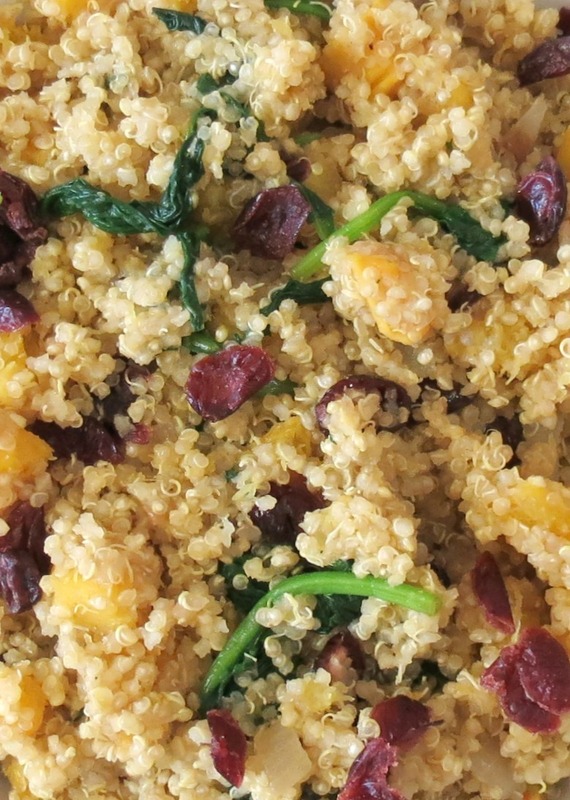 I love your combination of squash and cranberry with quinoa-a real winner. Thank you Laura! I love squash and cranberries together! One of my favorite combos! Pinning!! 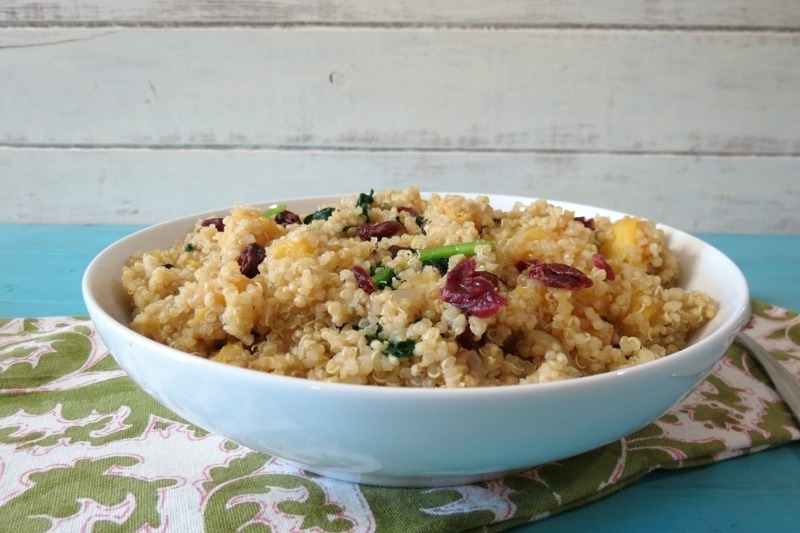 Delicata squash is my favorite and I LOVE quinoa. What an absolutely lovely recipe! Thank you Kim! 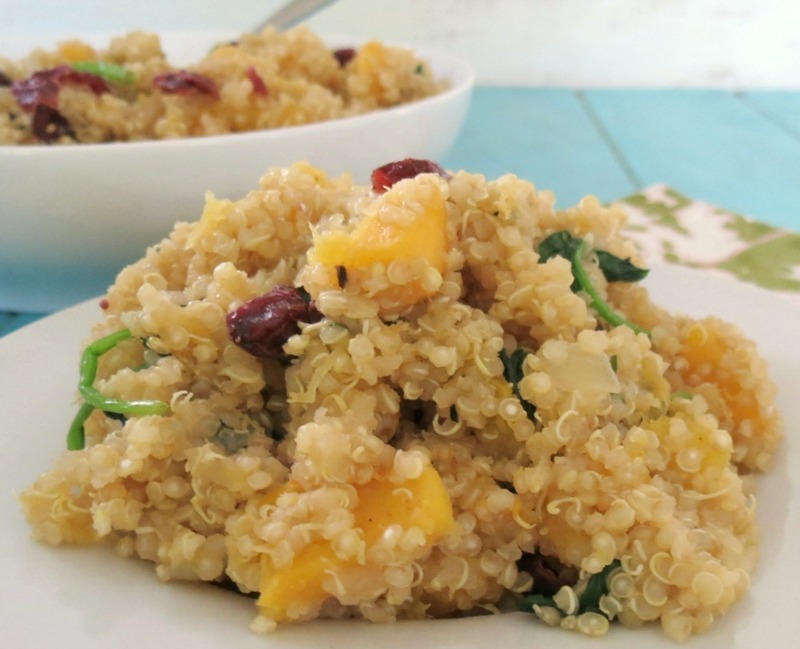 I am so loving quinoa right now! It’s so perfect with just about anything. Girlfriend, you’ve done it again!!! I’m so glad that I subscribe to your blog!!! Ahhh thank you Shelia! Your awesome and made my day! Jennifer – This sounds delicious! Did you know that you don’t need to peel Delicata squash? The outer skin softens as it cooks. I love to cut it in half, remove seeds, slice into crescent-shaped slices, toss in a little bit of olive oil, then roast. It tastes so good and is much easier to prepare. Hi Beth! I have had the skin of the Delicata squash and it’s wonderful. The only problem for me, is it gives me heart burn? I don’t know why? But I love how simple it is to prepare! It’s an awesome little squash! Omg! This looks SO delish! I also just happened to have 2 delicata squash sitting on my counter! Can’t wait to try this and best of all it’s VEGAN! Love love love! HI Alison, This is a nice Fall dish, I hope you like it. Let me know what you think.